So, JoJo's only 11 weeks old now, but we're thinking ahead to when or if we want to neuter him. We figure we'd way till around a year...but, we've seen that there's a 70% uptick in noise anxiety in fixed dogs versus unfixed. So, since we're on a base with daily jets doing flybys, fireworks at times, and sirens for extreme weather...as well as owning a TV and such...has anyone experienced noise anxiety in their shiba after he's been altered? 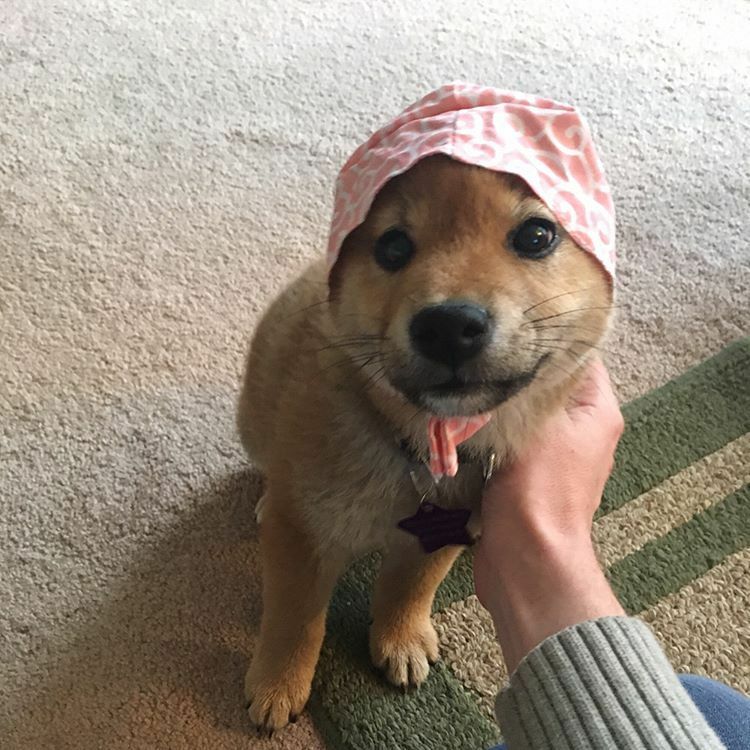 I will mention that he's excellent at 'sit' and appreciates being called a goodboy, because that was the only way I was able to capture him in this silly cat bonnet. I haven't noticed Ozzy being more anxious about noises since his neuter. He is still just as comfortable with thunderstorms and loud sounds. I don't know where the 70% number you reference is coming from or why it should be believed. I think it may have more to do with the individual dog or maybe even just age increasing. Even if the 70% is a realistic number, is that being compared to unaltered adult dogs or puppies that have not yet been neutered, or intact puppies vs themselves as adults..? It may just have more to do with maturity, training, behavior, personality, etc. Ozzy was neutered after he turned one. He's now 17 months old ha. So he hasn't experienced like the fireworks at the Fourth of July as a neutered doggo. He did perfectly fine with the new year's fireworks and did great last year during the Fourth of July fireworks. He's never been fearful or timid though. Genetics and physiology are also contributing factors in canine anxiety. In a recent Norwegian study that was published in Applied Journal Veterinary Medicine, it was found that out of 5,235 dogs, roughly 23% of the dogs were fearful of noises. Certain dog breeds, including the Shiba Inu were far more noise fearful than other breeds. Additionally, it was found that female dogs were 30% more likely to be fearful of noise than male dogs and neutered dogs were 72% more likely to be noise fearful than unaltered dogs. So I'm working off of this, since I'd never heard this before, but the dramatic increase in pre-versus post op dogs is surprising, especially if you count it as being all dogs, with Shiba's already having a higher margin than other breeds. Admittedly I'm trying to get JoJo used to sounds now when he's so young so it will potentially be less likely to experience this down the road...though he has picked up growling at the TV sometimes and occasionally following whatever barking other nearby dogs do, whereas before he'd ignore most things. That study is questionable. Some dogs are not introduced or desensitized to noises prior to being neutered and people make an assumption that it was because of this (correlation does not equal causation). This study reads like the variables were not well taken into consideration, and without being able to read the entire study, makes me wonder what the age-range variances and lifestyles were like to determine this. Did they test the dogs before and after they were neutered? Probably not. Were these puppies, adults, adolescents? Probably mixed, from the looks of it. Gotta be careful with these kinds of studies. We recently found out that my Coal is a little noise sensitive. It was an accident, something we were looking at off of you tube and he really was responsive. Not fearful, but definitely different from other times. We are already figuring out how to work with him because fireworks are coming soon. This was before he was neutered. If you work with your dog now on desensitization and conditioning, you probably won't see much. There is a chance that he will be more sensitive fresh out of surgery, especially because those E-collars act like sound cones in magnifying everything around their ears, but it should fade out after you remove the collar.